Since spring is officially in full swing thanks to this week's gorgeous weather, I wanted to do a quick post on the blush shades I find myself reaching for most this season. Benefit Dandelion Box o' Powder Blush: A gorgeous soft, baby pink with a satiny finish. I like to use this blush when I want to add a natural-looking warm flush to my cheeks. This is a very sophisticated blush that is perfect for the workplace! Milani Rose Powder Blush in Tea Rose: Neutral-toned light, dusty rose shade. 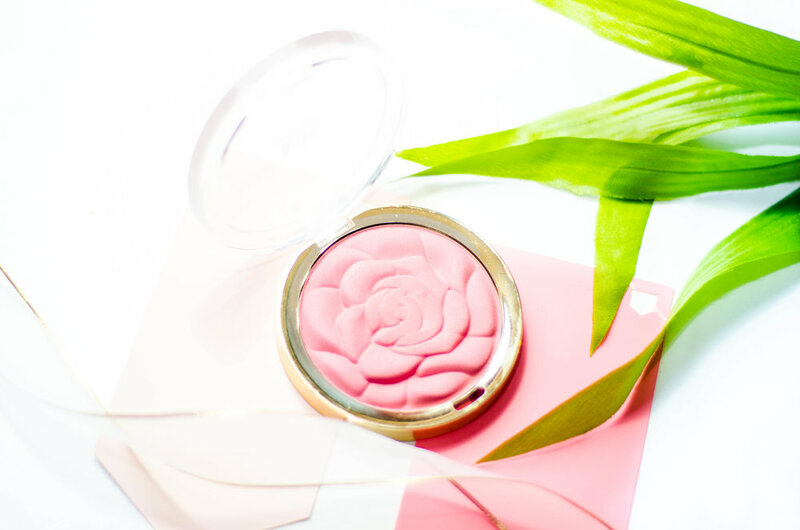 This blush screams springtime just from its packaging alone! The rose petal design almost makes me want to avoid using it, but Tea Rose is too stunning of a shade to let it go to waste. This is similar to Benefit's Dandelion blush in that it is a soft pink that looks super natural and can also be built up. However, Tea Rose has more of a matte finish than Dandelion. Palladio Beauty Baked Blush in Blushin': The most stunning bright, coral pink shade with golden shimmer throughout. I love using this blush on days where I don't use any highlighter on my cheekbones as it adds some extra dimension to my face makeup. You can also apply this with a wet brush to really make your cheeks pop. I generally am not a huge fan of warm-toned corals, but this shade is seriously what dreams are made of if you're a fan of glittery blushes. Model Co Blush Cheek Powder in Peach Bellini: Bright, orangey-peach blush that gives the skin a natural radiance. I don't notice as many apparent sparkles/shimmer in this shade as I do with Palladio's Blushin', but my do cheeks look glowy upon application. I like wearing this blush on sunny springtime weekends - it is very pigmented and a bit frosty and thus a little too much to be wearing to work in my opinion. What are your favorite blush shades for the springtime season? Leave a comment below!